On a quiet, rainy Sunday in Washington, I met with Pamela, my local ambassador for Atlas Corps, the partner organization for the Bassem Sabry Democracy Fellowship at the Tahrir Institute for Middle East Policy. We talked about American culture and our experiences working at nongovernmental organizations, and the conversation turned to feminism. Coming from a country where abortion has been legal since 1965 and the gender wage gap is a foreign concept, sometimes I had mixed feelings about the stigma surrounding feminism and the American media’s obsession with it just because it appeared “cool.” It almost seemed like one of those unsolicited “democracy pills” that foreign countries give us from time to time to exert control and “liberate” us. Tunisia is viewed as the most progressive country with respect to women’s rights in the Arab world. Given where I come from, it is inherent to me that a woman should be in charge of her own life and cannot accept any form of social and state constraints over her personal choices in life or human rights. However, the sociopolitical reality of today’s world is far from this ideal. Women are still victims of gender-based violence, sexual harassment, and — especially in the United States — other workplace inequalities, including discrimination based on family responsibilities and a lack of guaranteed paid maternity leave. According to academic research covering 190 countries, 178 countries as of 2011 guaranteed paid maternity leave under national law; however, just three, including the U.S., did not offer any legal guarantee of paid maternity leave. During my conversation with Pamela, she noted that in 2017 a senatorial candidate accused of sexual assault was nearly elected in Alabama, receiving almost half of the votes. Last November, nine women accused Roy Moore of sexual misconduct. Of the three women who said that Moore had sexually assaulted them, one was 16 and another only 14 at the time of the alleged incident. At that time, Moore would have been in his early thirties. The age of consent in Alabama was 16 at the time. Alabama Republicans largely defended Moore from the allegations and showed support without calling for any investigation about the alleged incidents. Pamela highlighted how dangerous it would be for women if he had won and the allegations were true. She also mentioned how supporters were willing to turn a blind eye to these allegations, even if they were substantiated, because the candidate’s political agenda aligned with their interests. 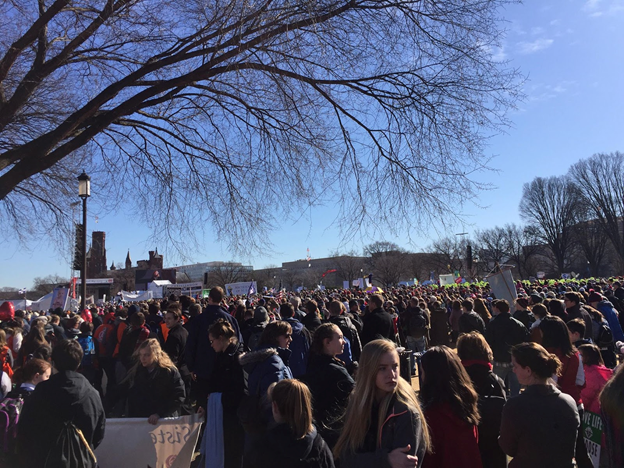 During my first week in Washington, a march against abortion took place on January 19, drawing thousands of protesters. A group of anti-choice demonstrators called for punishing abortion healthcare providers, including private hospitals, and limiting access to such services. 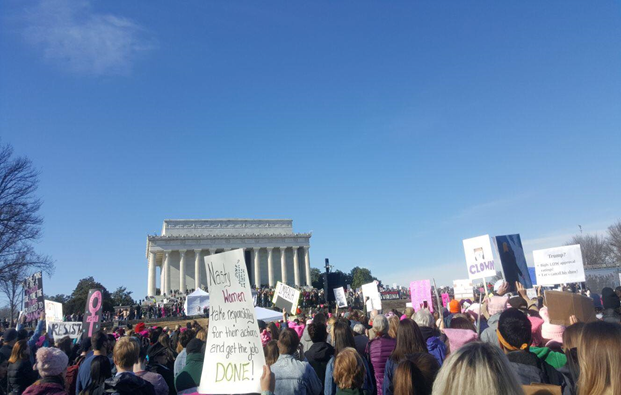 The following day, a similarly large crowd of protesters showed up for the Women’s March, during which thousands of women and men called for gender equality, women’s rights, and a more just society. Observing the stark contrasts between both crowds, despite the similarities in size, was shocking. Compromises may be made for freedom, but the responsibility of citizen increases when a society becomes incredibly polarized between equally large camps. Faced with a large group calling for setbacks in what many human rights groups view as women’s rights, standing up for feminism should be a duty, a lifestyle, and a daily fight. Showing up for the Women’s March and using every opportunity to be active is mandatory to advance women’s cause as a human right in the U.S. in the current politically threatening context. More than ever, this is the time where American society should stand up together to push for establishing policy reforms that respect women’s rights and providing legal solutions for workplace gender inequalities. Instead of working toward making “America smart and humble again” — per the slogans carried in the Women’s March — some groups, including outright misogynists, call for the elimination of existing women’s gains. This is why feminists should be visible and claim every opportunity to showcase our struggle. There is no way downward. There is still long way for America to go in terms of women’s rights, but it should not be on a path toward regression.